Review: "Megadeth: Back To The Start - Greatest Hits" - Sea of Tranquility - The Web Destination for Progressive Music! 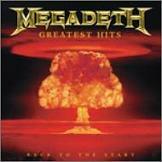 Dave Mustaine has finally given the Legions of Megadeth followers the single most requested CD of all. A compilation of the bands greatest pieces all in one easy place to find them. There is no questioning the genius of Mustaine when it comes to putting together a great metal song, and he has many of them which make this piece a welcome addition to the catalog. Before this arrived the closest example of this we would have would be with the live CD/DVD Rude Awakening. This piece in particular had an amazing selection and was almost as good as a career compilation since one was not available at the time. However, this is no longer the case and I immediately enjoyed this piece for it included almost all of the Megadeth tracks that I have enjoyed over the years. Dave made sure to have a great amount of material on this collection and with 17 tracks you cannot go wrong. This CD is even perfect tailgate party music. There is nothing better than kicking back some beers with your Friends at a show, and cranking up the Megadeth (that is provided you are legal drinking age of course). Everything the die-hard or casual fan would expect to find is here "Peace Sells", "In My Darkest Hour" and "Wake Up Dead". He also included the masterpiece "Hangar 18". I would have to label it as a CD with something for everyone. There is a limited edition that includes a DVD that I was not given as part of the review yet this CD is quite simply a must buy. It arrives in perfect time for The Gigantour, which is a massive concert tour featuring Megadeth as the headliners with Dream Theater and a number of others as well.